Ciby 2000/Jan Chapman Productions - 120 min. Cast: Holly Hunter, Anna Paquin, Harvey Keitel, Sam Neill, Kerry Walker, Genevieve Lemon, Tungia Baker, Ian Mune. Screenplay: Jane Campion; Photography: Stueart Dryburgh; Editor: Veronika Jenet;, Music: Michael Nyman; Producer: Jan Chapman; Director: Jane Campion. In the 1840s a mute Scottish woman makes the voyage from England to New Zealand, with her young daughter, for a prearranged marriage. She brings with her a piano, as music is her refuge in an uninviting environment. Her arranged husband is unimpressed with the piano and leaves it on the beach, before swapping it with a neighbor for land. The neighbor bargains with her for the return of the piano if she gives him lessons, but his deal is motivated by romantic rather than musical interest. Winner of New Zealand's first Academy Awards; it has won many other awards including the Cannes Palme d'Or, however it has its detractors. In any case, if you have not gotten around to it, you need to put it on your must see list. R2 PAL DVDs can be found from UK sources for about 6#. R1 NTSC DVDs are going for about $10us. New standard R4 PAL DVDs are selling for about $20nz or $15au. A "Collector's Edition" R4 DVD was released, in Australia and New Zealand. It is 116 minutes but the 1.85 widescreen is enhanced for 16x9 and the sound has been upgraded to 5.1 surround, however there still is a 2.0 option. 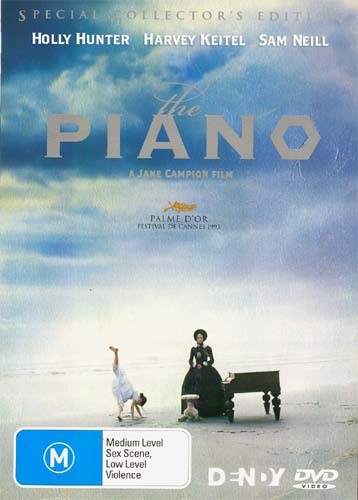 Extras include: Optional English subtitles, trailer , commentary track by Jane Campion and Jan Chapman, 'Inside The Piano' featurette and a Limited Edition booklet. It is selling in New Zealand for about $35nz. The R2 version of the "Special Edition" version was released in the UK, selling for about 10#. In addition to the items listed in the R4 limited edition, it also contains extended interviews with Jane Campion, Jan Chapman and Michael Nyman. Dendy(Au) has released a region B Blu-ray version which is selling for about $30au/nz. 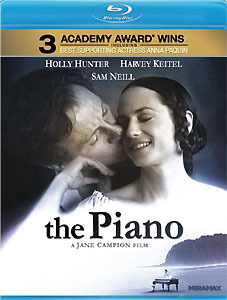 Extras include the "Inside the Piano" featurette (15:06), trailer and the commentary track by Jane Campion and Jan Chapman that is included with the "Collector's Edition R4 DVD. It is presented 1.78:1 1080i (Yes, that is 1080i, not 1080p) with audio of English DTS HD Master 5.1 or English Dolby Digital 5.1. It does offer subtitles in English. Starting 31 January, 2012, a Region A Blu-ray was released in North America. It is 1080p with a DTS-HD Master 2.0 spoken English soundtrack, with English and Spanish subtitle options and sells for about $10us. Other than trailers, it has no extras. On 20 January 2014, a Region B Blu-ray was released. It is 1080P 1.85:1 with 5.1 DTS HD Master spoken English audio with an English subtitle option. Additionally there is an option audio commentary track, a "Making of" featurette, an interview with Jane Campion and Jan Chapman and the trailer. Starting 10 December 2014, a digitally remastered 1080p Blu-ray was released in Australia. It's basic specs are similiar to the StudioCanal UK one in that it has the audio commentary track and a "Making of" extra, but also has an English subtitle option. It is an All Regions disc with DTS-HD-MA 5.1 and DD-HD 5.1 spoken English tracks. As of May 2017, the best sources for this one would seem to be at ebay. Starting 16 July 2018, a 25th anniversary Region B Blu-ray edition release set from StudioCanal UK was released, selling for about 15#. It is a 2-disc set with audio commentary by Jane Campion and Jan Chapman. It also contains a new "Making of" featurette. The second disc is a CD of the original soundtrack. The set also includes a booklet with essays by film critic and broadcaster Anna Smith, Screenwriter and critic Kate Muir and film journalist and editor-at-large Helen O'Hara of Empire magazine. 1993 - Australian Film Institute - Best Film; Director; Leading Actor: Harvey Keitel; Leading Actress: Holly Hunter; Cinematography: Costume Design; Editing; Production Design; Sound; Original Music Score; Original Screenplay. 1993 - Boston Society of Film Critics - Best Actress: Holly Hunter. 1993 - Camerimage, Poland - Best Cinematography. 1993 - Cannes - Golden Palm - Best Actress: Holly Hunter. 1993 - Los Angeles Film Critics Association - Best Actress: Holly Hunter; Director; Supporting Actress: Anna Paquin; Screenplay; Cinematography. 1993 - National Board of Review - Best Actress: Holly Hunter. 1994 - Academy of Motion Pictures Arts & Sciences - Oscars for: Best Actress in a Leading Role- Holly Hunter; Best Supporting Actress- Anna Paquin; Best Screenplay for the Screen. 1994 - Producers Guild of America - Golden Laurel for Most Promising Producer in Theatrical Motion Pictures. 1994 - Writers Guild of America - Best Screenplay written directly for the Screen.